(1) HE’S FROM THE FUTURE. Dennis Mathis tells how he learned to understand “the reader” in “The Future Began on a Tuesday” at the SFWA Blog. The future was twenty-five years old and not getting any younger when I was accepted to the Iowa Writers Workshop, the legendary (even then) graduate program for writers. Kurt Vonnegut, who had taught there, said, “Picture Harvard Law School if only one out of ten graduates actually becomes a lawyer.” Dedicated to the principle that the last thing you’d want happening in a classroom is teaching, the Workshop strove to be the opposite of academic, and more or less succeeded. Zipping their lips about how writing should be done, the staff was restricted to role-modeling the lifestyle of a writer: mostly competitive drinking, womanizing, wrestling, and snorting at weaklings; the Viking concept of higher education. Despite being a weakling myself, I did the best writing of my life. And then in my second year, a last-minute substitute on the Workshop staff. A guy named Frank Conroy, author of only one book, and it wasn’t even fiction — who writes a memoir in their twenties? — who’d taught creative writing only once before, at (get this) M.I.T. He specified we were to read the worksheets (someone’s delicate work-in-progress cast into the lion’s den) pen-in-hand, poised to mark any point in the text where we felt a “bump,” no matter how vague. In class, we went through the worksheets sentence-by-sentence, hashing-out whether some reader’s bump was an idiosyncratic misreading or an actual problem. They always turned out to be problems. If a reader misreads, Conroy taught us, it’s always the writer’s fault…..
(2) CHINA’S SPACE PROGRAM. Motherboard has the story: ”China’s Newly Launched Space Station Will Receive Its First Crew Next Month” . China successfully launched its second space station, Tiangong-2, into orbit on Thursday at 10:04 AM EDT, from Jiuquan Satellite Launch Center in the Gobi Desert. It will soon be an orbiting home to two taikonauts (the Chinese term for astronauts). The mission is regarded as a key stepping stone towards the nation’s larger spaceflight ambitions, which include sending taikonauts to the Moon and eventually to Mars…. This second generation spacecraft, whose name translates to “Heavenly Palace” in Mandarin, will conduct some initial tests before boosting itself even higher to an altitude of 393 kilometers, roughly on par with the International Space Station (ISS). If all goes according to plan, the tubular orbital laboratory will receive its first taikonauts in late October on a spacecraft called Shenzhou-11. Though the names of the two crew members have not been released, they are both men, and they are expected to spend 30 days aboard Tiangong-2, according to Xinhua News. If successful, it will be the longest manned Chinese space mission to date. In terms of specs, the new station is almost identical to its precursor, Tiangong-1, which operated in space from September 2011 until March 2016, and is on track to deorbit and immolate in the atmosphere next year. (3) COMIC ART EXPLORED. Superheroes have taken over the Huntsville Museum of Art in the Rocket City of Huntsville, Alabama. “My Hero: Contemporary Art & Superhero Action” is the name of the show running through December 11. For decades popular culture has been fascinated by superheroes — their superhuman capabilities, their desire for truth and justice, and their ability to save the day. Their storylines have captivated many, and their images have become contemporary idols throughout the world. My Hero presents a rich array of work by over 50 international artists, including painting, illustration, photography, sculpture, mixed media and video, that celebrates and re-envisions the lives of iconic superheroes. (4) ROOTS OF THE GENRE. Atlas Obscura writes about Margaret Cavendish. “One of the Earliest Science Fiction Books Was Written in the 1600s by a Duchess”. No one could get into philosophical argument with Lady Margaret Cavendish, Duchess of Newcastle-upon-Tyne, and walk away unchanged. Born in 1623, Cavendish was an outspoken aristocrat who traveled in circles of scientific thinkers, and broke ground on proto-feminism, natural philosophy (the 17th century term for science), and social politics. In her lifetime, she published 20 books. But amid her poetry and essays, she also published one of the earliest examples of science fiction. In 1666. She named it The Description of a New World, Called the Blazing World. In the story, a woman is kidnapped by a lovesick merchant sailor, and forced to join him at sea. After a windstorm sends the ship north and kills the men, the woman walks through a portal at the North Pole into a new world: one with stars so bright, midnight could be mistaken for midday. A parallel universe where creatures are sentient, and worm-men, ape-men, fish-men, bird-men and lice-men populate the planet. They speak one language, they worship one god, and they have no wars. She becomes their Empress, and with her otherworldly subjects, she explores natural wonders and questions their observations using science. (5) MEMBERSHIP IN THE GUARDIAN. The Guardian is going through a financial squeeze. The Guardian is scaling back its U.S. operation through a staff reduction of 30 percent, according to a source with knowledge of the plans. The Guardian, a 195-year-old British newspaper and global news site, has struggled financially as print revenue and circulation collapsed throughout the industry. Earlier this year, The Guardian announced plans to cut costs by 20 percent over three years, and nearly 270 employees in the U.K. operation took buyouts in June. Now the U.S. operation, which was launched in 2011, is grappling with what Guardian Media Group CEO David Pemsel described Thursday in a staff meeting as a “course correction.” Guardian US chief Eamonn Store informed staff the company was facing a $4.4 million budget shortfall, thereby necessitating major cuts. (6) PRIDE OF STARFLEET. Nalo Hopkinson went to her first sf convention in 1978 outfitted as Lt. Uhura. September 16, 1966 — Fahrenheit 451 premiered in theaters. Things changed when I volunteered; I ended up hauling ice and stocking drinks for the hospitality suite. I was only there for a couple hours, but I got to glimpse this community at its best. I saw MIMO crew helping set up plates of vegetables, people who brought their whole family to volunteer. People who talked about how this was there 10th, 20th, or more convention. They weren’t writers, or publishers, they were just sincere fans. On top of that the con staff were so grateful I helped out in a pinch, and there sincerity stunned me. It made me feel like I had made a difference, however small, and I like that I got to give back, even a tiny bit. That’s when I saw this wasn’t a community of writers talking about writerly things. This was a community of fans, of people pitching in to make sure that this worked. They helped each other, and they did it to make the best experience they could for everyone. The second major turning point was during the Hugo ceremony itself. At one point they did a retrospective of all the members who had died in the previous year. And as I watched this somber stream of names scrolling up, I noticed that yes there were several creators, screen-writers, and editors. There was also plenty of people listed as just “fan” or “volunteer.” The fact that the organization took time to recognize these people, some of whom were just and only fans, showed just how deeply some people cared about this community. (9) TWEETER’S DIGEST. It’s a commonplace that not everything people want to say will fit in a 140-character tweet. And yet here’s someone who has summarized every Stephen King novel in 140 characters or less. (10) NOT ONLY A MESSAGE. Those who are allergic to political messages in sf may break out in hives by the time they’ve made it through “The G’s List of Mind-Bending/Expanding SF/F Novels” at Nerds of a Feather. (12) ORSINIA. 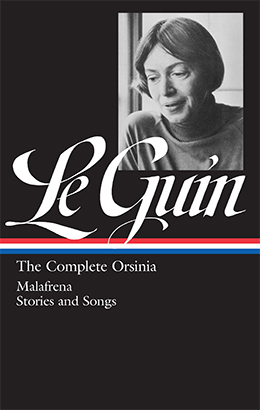 The Paris Review has posted an excerpt from the introduction to Ursula K Le Guin’s Library of America editions — Ursula K. Le Guin: The Complete Orsinia (Library of America, 2016). Much as I loved my studies, their purpose was to make me able to earn a living as a teacher, so I could go on writing. And I worked hard at writing short stories. But here my European orientation was a problem. I wasn’t drawn to the topics and aims of contemporary American realism. I didn’t admire Ernest Hemingway, James Jones, Norman Mailer, or Edna Ferber. I did admire John Steinbeck, but knew I couldn’t write that way. In The New Yorker, I loved Thurber, but skipped over John O’Hara to read the Englishwoman Sylvia Townsend Warner. Most of the people I really wished I could write like were foreign, or dead, or both. Most of what I read drew me to write about Europe; but I knew it was foolhardy to write fiction set in Europe if I’d never been there. At last it occurred to me that I might get away with it by writing about a part of Europe where nobody had been but me. I remember when this idea came: in our small co-op dorm at Radcliffe, Everett House, in the dining room, where you could study and typewrite late without disturbing sleepers. I was twenty years old, working at one of the dining tables about midnight, when I got the first glimpse of my other country. An unimportant country of middle Europe. One of those Hitler had trashed and Stalin was now trashing. (The Soviet takeover of Czechoslovakia in 1947–48 had been the first event to rouse the political spirit in me.) A land not too far from Czechoslovakia, or Poland, but let’s not worry about borders. Not one of the partly Islamized nations—more Western-oriented … Like Rumania, maybe, with a Slavic-influenced but Latin-descended language? Aha! I begin to feel I’m coming close. I begin to hear the names. Orsenya—in Latin and English, Orsinia. I see the river, the Molsen, running through an open, sunny countryside to the old capital, Krasnoy (krasniy, Slavic, “beautiful”). Krasnoy on its three hills: the Palace, the University, the Cathedral. The Cathedral of Saint Theodora, an egregiously unsaintly saint, my mother’s name … I begin to find my way about, to feel myself at home, here in Orsenya, matrya miya, my motherland. I can live here, and find out who else lives here and what they do, and tell stories about it. (13) THIS JUST IN 17 YEARS AGO. J. K. Rowling sounds a little exasperated here. (14) DINNER BELL. 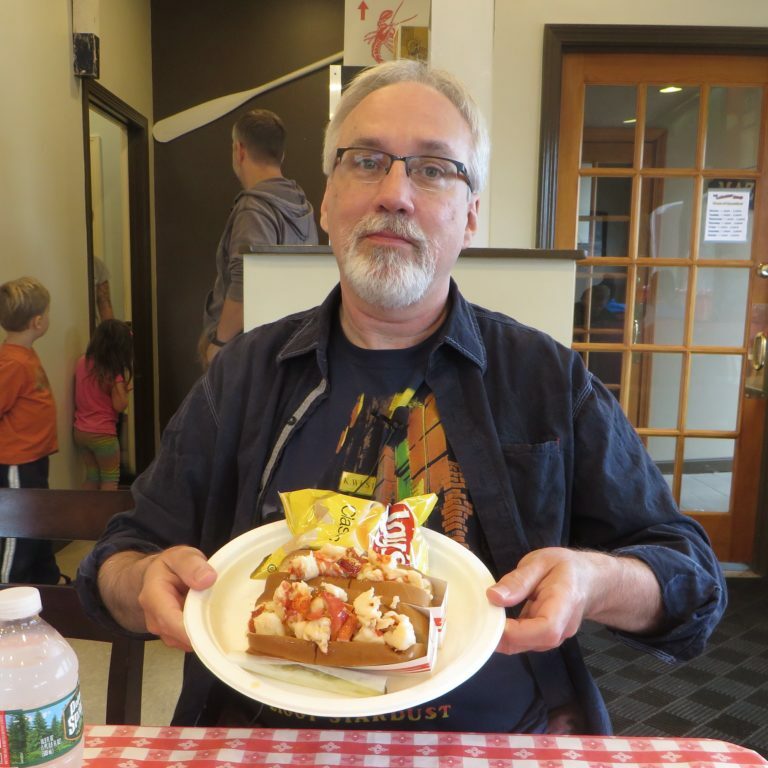 Scott Edelman has released Episode 18 of his Eating the Fantastic podcast where you are invited to “Dig into a lobster roll with F. Brett Cox”. Now it’s time to say farewell to Readercon with a visit to The Lobster Stop in Quincy, Massachusetts for (what else?) lobster rolls … and F. Brett Cox. Brett co-edited (with former Eating the Fantastic guest Andy Duncan) Crossroads: Tales of the Southern Literary Fantastic (which featured a story about Randy Newman by yours truly! ), and has had fiction, poetry, essays, and reviews appear in Eclipse Online, War Stories, Century, Lady Churchill’s Rosebud Wristlet, Postscripts, and many other venues. He’s also hard at work on a book-length study of Roger Zelazny for the University of Illinois Press. Question for the class: what is the greatest sitcom theme song of all time and why is it Laverne and Shirley? I don’t know what she’d pick as the best theme for a dramatic series – for me it’s the theme from Hawaii 5-0. I’m also a fan of the Mission: Impossible theme, and have a real soft spot for the full rendition of The Virginian theme. This entry was posted in Pixel Scroll and tagged Catherynne M. Valente, F. Brett Cox, J. K. Rowling, Joe Hill, Mike Headley, Nalo Hopkinson, Scott Edelman, Star Trek, Stephen King, Ursula K. Le Guin by Mike Glyer. Bookmark the permalink. (15) According to my brain, it’s a huge battle between The Golden Girls, The Facts of Life, or friggin’ Growing Pains. Recent read: “Breaking Water” by Indrapramit Das. Krishna is quite unsettled when he bumps into a woman’s corpse during his morning bath in Kolkata’s Hooghly River, yet declines to do anything about it–after all, why should he take responsibility for a stranger? But when the dead start coming back to life en masse, he rethinks his position and the debate around how to treat these newly risen corpses gets a lot more complicated. In this story from Indrapramit Das, a journalist strives to understand Krishna’s actions and what they say about the rest of society and how we treat our dead. Still immersed in Godstalk II…. (12) I’m very happy to see all the Orsinian stories collected and republished – they’re among my favorite of Le Guin’s works. Can’t blame Rowling for feeling exasperated, given the amount of crap flung her way on social media. Animated: “This Is It!” from The Bugs Bunny Show. Best show biz song ever. Also Great: Mission Impossible, Lost in Space, Red Dwarf, Twilight Zone. Is this crying out for another bracket? ULTRAGOTHA: Is this crying out for another bracket? Yes. Yes, I think it is. In a time of ancient godstalks, tickies and fifths, a hive in turmoil cried out for a bracket. She was Kyra, a mighty filer forged in the heat of fannish battle. The power…the passion…the dice. Her brackets will change the world. 11) Anyone attend Nerdcon last year? Just curious what it was like. I’m another vote for Magnum PI. I think it might be the TV theme tune that my brain was trying to recall and compare subconsciously to a particular Rush instrumental off Snakes and Arrows that was, for this reason, itching and itching at my backbrain. The opening theme to Warehouse 13 always gives me happy chills, too. Fair warning: my criteria for theme song brackets will be based on A) how immediately the tune starts playing in my head once prompted; and B) how long it takes to dislodge it once there. So many TV themes to choose from. Yes it’s another vote for s.
The original Outer Limits theme by Dominic Frontiere. The Equalizer (by Stewart Copeland). Hm – is it just me or has the edit window disappeared? For drama/instrumental I like the theme from Sandbaggers. Also, The Prisoner. With sitcoms there are just so many to chose from. I’ve always liked the WKRP in Cincinnati theme. PhilRM, I got an edit window this time, at least. There. M*A*S*H theme allllll gone. Oh, wait, Bosom Buddies. Totally forgot that one. Favorite themes: Mostly anime (Cowboy Bebop, Ghost in the Shell: Standalone Complex, etc.) or British crime series (Wallander and Luther, e.g.). I’ll be back again this year. Looks like another good mix of guests — I’m looking forward to Saladin Ahmed in particular. You ninja’d me! I was about to write The Rockford Files and The Greatest American Hero. As far as music within a show, Bear McCreary did some outstanding work for the Battlestar Galactica reboot. And the original Galactica theme wasn’t too bad either. Well, thanks for that… I think. I just spent ~8 minutes watching the best of Firefly witticisms. Plus an extended version of “The Hero of Canton”. Oh, so many. I’m going to be browsing youtube! The Peter Gunn theme came to mind. . . .
I’d also have to put Game of Thrones up there. Also, another favorite is Sonic Youth’s version of the Simpson’s theme (used as an outro for one of their episodes). The Red Dwarf theme is still stuck in my head and I haven’t seen it for ages, so I guess it’s the best! Seems to be an intermittent thing; had it happen to me recently. Kip W.: I’m with you on the Perry Mason theme, which I’d never realized had an actual name! “Park Avenue Beat”–yeah, all right. @JJ: There is nothing “guilty” about liking Post/Carpenter themes. Theme songs just aren’t what they used to be, since TV shows mostly don’t have extensive credit sequences nowadays. So you get things like LOST, with one chord. Joe H.: I strongly urge everyone to watch the video of Patrick Rothfuss, Mary Robinette Kowal, Hank Green, Maureen Johnson, Joseph Fink (of Welcome to Night Vale) and Paul Sabourin (of Paul & Storm) playing a game of Baron Munchausen. Cheers. I think it is those lines about hanging the SJW credential up by it’s tail that does it. Or perhaps the one with your husband wanting to be a girl. But of course, those lines were never aired. For UK viewers of sufficient antiquity, Robinson Crusoe, Z-Cars, Robin Hood and Robin (of Sherwood) Hood. The BBC has often done well with themes for particular sports coverage, Wimbledon, Horse of the Year, Match of the Day, Ski Sunday and Formula 1 are or were instantly recognisable. Funny, when I saw today’s scroll, I thought “today’s comments will all be about 15”. Was not wrong. And of course the opening theme to any of the Gerry Anderson Super Marionation series, though I was never so keen on the songs over the end credits. Gollancz has a bunch of books on 99p sale this weekend only. Probably UK only, but who knows. OMG, how could I have forgotten?